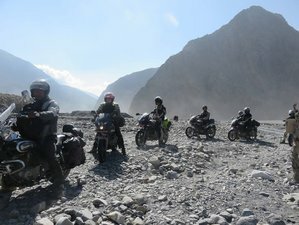 Join this unforgettable and adventurous thrilling motorbike tour to enjoy a dramatic view of the Himalayas with a sight of different kind of topography view, weather, local villages, and their lifestyle! Himalayan Leaders is one of the leaders of the motorbike in Nepal which has many years of experience in organizing the motorbike tour with a genuine 500cc Enfield Bullet or other bikes as per required and its team is proud to propose. This is an assurance of quality for your motivation, fun, and experience on the exclusive mountain adventure. You will be staying in hotels, resorts, and lodges provided by Himalayan Leaders during the tour. Arrival and transfer to hotel. After some refreshment, you will enjoy a typical Nepali welcome dinner. After breakfast in the hotel, it's time to visit Pashupatinath - the most venerated Hindu temple of Nepal and Boudhanath, the biggest Buddhist stupa architecture of the world. It really will impress you for sure. In the afternoon, the trip continues to the famous sightseeing of Bhaktapur and Patan - the medireview principalities of Kathmandu Valley. You will visit old royal palaces, temples, stupas, and monasteries where you will see lots of striking intricate wood and stone works. In the late afternoon, you will return back to the hotel in Kathmandu. After breakfast, you will drive along the famous and broad Trisuli River and see many traditional Tamang villages. The landscape varies much but the green forests dominate this beautiful area. You will have close panoramas of the mountains of Annapurna, Manaslu, and Langtang range. After this inspiring tour, you will have your tea waiting at the guesthouse in the village of Syabrubesi at the beginning of the Langtang National Park. You will drive through Trisuli River with the views of green valley including mountain views. Gorkha is a scenic hill-town with great historical significance. King Prithvi Narayan Shah, who unified the Kingdom of Nepal during the eighteenth century, was born in the township of Gorkha. Situated on a small hillock at an altitude of about 11600 meters, Gorkha offers a panoramic view of snow-fed mountains. The Manakamana Temple situated in the Gorkha district of Nepal is the sacred place of the Hindu Goddess Bhagwati, an incarnation of Parvati. The Manakamana Temple lies 12 kilometers south of the Gorkha town. The spectacular views of the Manaslu - Himachali and Annapurna ranges can be seen to the north of the temple. You will be driving through Marsyandi River, with views of the green valley and the increasingly hilly area, enjoying the mountain range of Ganesh, Manaslu, and the Annapurna on the way. In the morning, you will visit waterfall, Japanese stupa, and Sarangkot where you can have great views of Dhaulagiri, Annapurna, Manaslu, and Ganesh Himala. You will drive about 85 kilometers to Beni through Kaligandaki River with scenic views of Annapurna. Beni is the headquarter of Myagdi District. Then, you will drive uphill about 20 kilometers through Kali Gandaki River. The trail rises and falls through small villages. At the end, you can have a nice bath on natural hot spring where you can enjoy nature sounds of the wildness. You will leave early in the morning after breakfast uphill from Tatopani to Muktinath via Dhana, Ruptse, Ghasa, Jomsom. The trial follows the Kali Gandaki valley. The river cuts a channel between the peaks of Annapurna 1 and Dhaulagiri, thus, qualifying the Kali Gandaki valley for the title of the world's deepest gorge. Muktinath is an important pilgrimage center for Hindus and Buddhists. The most well known holy place is a Vishnu temple where there are 108 spouts, fashioned in the shape of cows' heads, pour forth water that is considered to be holy. This water is channeled from a stream running above the temple. The temple is built in Tibetan style and contains huge brass idols of Vishnu, Shiva, Brahma, and Kali. You will hike to Kagbeni via Lubra and Panga, stop at the Bon Monastery. Today after breakfast, you will bike with some shining downhill all the way to Beni. You will bike for about four hours with the same way back and cross small villages, see the magnificent waterfall. After breakfast, you will motorbike to Tansen, a colorful hill town. It is the most popular summer resort in western Nepal on account of its location and climate. It offers the most extensive views of the country’s main attraction, the Himalaya from Dhaulagiri in the west to Gauri Shankar in the north-east. You will have a short visit of Tansen bazaar to see the medieval Newari brick houses then continue to drive along a scenic mountain highway to Lumbini. It is famous for Lord Buddha. In the morning after breakfast, you will visit Lumbini Garden with its famous Mayadevi temple, Ashoka pillar, the holy pond, the eternal flame, and the monasteries built by various Buddhist nations to commemorate the birthplace of Lord Buddha. Then after lunch, you will drive to Chitwan. In the morning after breakfast, you will have a canoe trip where you can explore many kinds of birds, crocodile, wild animals, then go to Elephant Breeding Center. After that, you will return back to the hotel and have lunch. After lunch, you will have a bike tour to 20,000 lakes where you have many chances to explore more wild animals, birds, lakes, plant, and return back to the hotel in the evening for cultural dance program. In the early morning, you'll have a nature walk for about one hour to see birds including many wildlife animals. Then, after breakfast, you will motorbike to Daman, crossing through village and landscape. Daman is famous for mountain views with sunset and sunrise of Mount Everest, Dhaulagiri, Annapurna, Ganesh Himal, Langtang, Manaslu, and many more Himalaya range. Then, you will spend a wonderful night in a resort. In the morning, you will enjoy an unforgettable scenery of the Himalayan range up to 300 miles. Then, after breakfast, you will drive for about six hours to Nagarkot where you can enjoy great Himalayas views with sunset. Today, you will drive mostly off-road passing through the village of Katike Bhanjyang. Wake up early in the morning to enjoy sunrise view over the great Himalayan ranges including Everest and others such as Langtang, Gaurishankar, Ganesh Himal, and many more. After breakfast, you will start your bike ride in low land area and you will reach Namo Buddha. The place where the Buddha offered his body to the hungry mother tigress, It is renowned for Shakyamuni's act of compassion upon encountering a hungry mother tigress. He offered her his body so that she could feed her cubs. There are a couple of monasteries and one ancient stupa erected nearby in which one can make offerings, pray, and light butter lamps. After visiting Nomo Buddha, you will continue to bike to Balthali. At Godavari, there are many other things to see and few of them are the shrine of Bishankhu Narayan, which is one of the most important shrines in the Kathmandu valley. Phulchowki Mountain is 2760 meters high mountain which is the highest point around the valley and from here you can see magnificent views from the summit. Phulchowki is famous for a home of 570 species of flower plants. One-third of all the birds of Nepal and the last surviving cloud forest can be found in Phulchowki. Phulchowki Mountain is more famous for its springtime flowers, particularly red and white rhododendrons. After breakfast, you will bike down to the Panauti Bazaar. Pride of this place goes to the massive, three-tiered Shiva. Some authorities believe this to be the original structure that was raised here in 1294 AD, which would make it the oldest surviving structure in Nepal. Just sightseeing around Panauti Bazaar and drive to Kathmandu. Starting and ending in Kathmandu, this tour will take you to explore the Himalayan Range in Nepal. The places you'll visit include Gorkha, Manakamana, Pokhara, Tatopani, Muktinath, Kagbeni, Chitwan National Park, Lumbini, Daman, Nagarkot, Melamchi, Balthali, and Godwari. Please book your flight to arrive at Tribhuvan International Airport (KTM). Transfer from and to the airport is included. Himalayan Leaders will pick you up from the airport. Airport: Tribhuvan International Airport Airport transfer included: Tribhuvan International Airport No additional charges. You can request this in the next step. A reservation requires a deposit of 10% of the total price. Himalayan Leaders provides the best quality of service available in the travel and tourism industry including motorcycle tours. trekking, and mountain biking. This tour requires a minimum of two riders.